Photo: Janine Antoni, Stephen Petronio, Anna Halprin, Rope Dance, 2015. Photo by Hugo Glendinning. Philadelphia, PA – On Thursday, April 21, 2016, The Fabric Workshop and Museum (FWM) premieres Ally, an exhibition of art and dance conceived and performed by artist Janine Antoni in collaboration with choreographer Stephen Petronio and movement artist Anna Halprin. Taking the form of performances, installation environments, videos, and sculptures, Ally will occupy four floors of the contemporary art museum in Center City Philadelphia for three months, through Sunday, July 31, 2016. A book will follow, edited by the British writer and performance scholar Adrian Heathfield and others. This complex installation project aims to connect Antoni, Petronio, and the audience on a very basic human and symbolic level. Swallow began with Antoni and Petronio making a unique performance for invited ‘witnesses’ in which they each swallowed half of a 10-foot strip of cloth woven by The Fabric Workshop and Museum. The recovered remnant of the cloth is housed in the visual centerpiece of the installation: a spot-lit, elevated gold reliquary. Inspired by the form of a traditional monstrance, the shape of the reliquary echoes that of the human body: its ‘diaphragm’ arches up to support two undulating ‘esophagi,’ topped by a ‘larynx’ that blooms to cradle a two-chambered, blown-glass vessel. An ornate magnifying lens crowns the reliquary, inviting the viewer to peer down into the dual chambers at the point in the fabric where Antoni and Petronio met. A book work edited by the British writer and performance scholar Adrian Heathfield in collaboration with the artists will be created as an element of Ally. The book will include essays from Heathfield, Carol Becker, Jacquelynn Baas and Richard Move, as well as a specially commissioned and translated work by the acclaimed French theorist and novelist Hélène Cixous. The book contains extensive documentation of the collaborating artists’ processes and works. 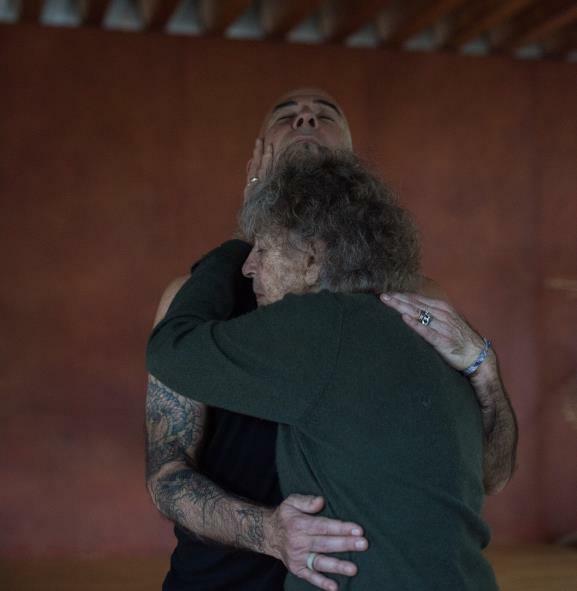 Photo: Stephen Petronio and Anna Halprin, 2015. Photo by Hugo Glendinning. Photo: Janine Antoni in collaboration with Anna Halprin, Paper Dance, 2013. Photo by Pak Han at Halprin Dance Deck. Janine Antoni (Bahamian, born 1964 in Freeport, Bahamas) graduated from Sarah Lawrence College in 1986 and received her MFA from the Rhode Island School of Design in 1989. Since then, her work has been featured in solo and group exhibitions at such institutions as the Whitney Museum of American Art, New York; Museum of Modern Art, New York; The Mattress Factory, Pittsburgh; S.I.T.E. Santa Fe; and The Irish Museum of Modern Art, Dublin. Recognized nationally and internationally for her entrancing works that bring together diverse media, Antoni has also participated in the Venice Biennale, Whitney Biennial, and the Johannesburg Biennale, among others. She has received many prestigious awards including the John D. and Catherine T. MacArthur Fellowship (1998), the Larry Aldrich Foundation Award (1999), the John Simon Guggenheim Memorial Foundation Fellowship (2011), the Creative Capital Artist Grant (2012), and Anonymous Was A Woman Grant (2014). Antoni lives and works in New York and is represented by the Luhring Augustine Gallery. Graduating with a BA from the University of Wisconsin-Madison in 1942, Anna Halprin (American, born 1920 in Winnetka, IL) has been called one of the most important theatre artists of the twentieth century. In an attempt to move away from the constraints of modern dance and engage in more exploratory movement, Halprin founded the San Francisco Dancer’s Workshop in 1955. In 1978 she went on to found the Tamalpa Institute, an organization dedicated to movement-based expressive arts healing and therapy, alongside her daughter Daria Halprin. Throughout her expansive career Halprin has received many awards, including a lifetime achievement in choreography from the American Dance Festival, and has been named one of “America’s Irreplaceable Dance Treasures” by The Dance Heritage Coalition. Halprin has also been the subject of an eponymous exhibition at The Museum of Contemporary Art, Lyon, France in 2006, as well as the 2009 documentary, Breath Made Visible. Halprin lives and works in Kentfield, California. For over 30 years, Stephen Petronio (American, born 1956 in Newark, NJ) has honed a unique language of movement that speaks to the intuitive and complex possibilities of the body informed by its shifting cultural context. He has collaborated with a wide range of artists in many disciplines over his career and holds the integration of multiple forms as fundamental to his creative drive and vision. Petronio received a BA from Hampshire College in Amherst, MA, where he began his early training in improvisation and dance technique. He was greatly influenced by working with Steve Paxton and was the first male dancer of the Trisha Brown Dance Company (1979 to 1986). He has gone on to build a unique career, receiving numerous accolades, including a John Simon Guggenheim Fellowship, awards from the Foundation for Contemporary Performance Arts, New York Foundation for the Arts, an American Choreographer Award, a New York Dance and Performance “Bessie” Award, and most recently a 2015 Doris Duke Performing Artist Award. His work has been presented globally and performed by some of the most significant companies working in contemporary dance. Petronio lives and works in New York. Adrian Heathfield is a writer and curator. His numerous books include Perform, Repeat, Record: Live Art in History (2012); Out of Now: The Lifeworks of Tehching Hsieh (2009); Live: Art and Performance (2004); Small Acts (2000); and Shattered Anatomies (1997). He is Professor of Performance at the University of Roehampton, London. Founded in 1977, The Fabric Workshop and Museum encourages international artists at all stages of their careers to experiment with new materials and new media in a veritable living laboratory, working with studio staff, educators, and apprentices. Through its renowned Artist-in-Residence Program, FWM’s collaborative process continues to build a permanent collection of some 6,000 works of art and an archive of diverse materials that preserve and document the course of artistic production from inspiration to realization. An ambitious program of exhibitions and publications, a dynamic website, and wide-ranging educational programming enhance FWM’s commitment to conveying a story of contemporary art that unites process with finished works of art of interest to a broad national and international audience. The programs of The Fabric Workshop and Museum are supported by AG Foundation; The Andy Warhol Foundation for the Visual Arts; The Arcadia Foundation; Christian R. and Mary F. Lindback Foundation; The Coby Foundation, Ltd.; Dolfinger-McMahon Foundation; E. Rhodes and Leona B. Carpenter Foundation; Edna W. Andrade Fund of The Philadelphia Foundation; The Honickman Foundation; Institute of Museum and Library Services; The Knight Foundation; LLWW Foundation; Louis N. Cassett Foundation; Museums ConnectSM made possible by the US Department of State’s Bureau of Educational and Cultural Affairs and administered by the American Alliance of Museums; National Endowment for the Arts; New Millennium Charitable Foundation; The New York Community Trust; Pennsylvania Council on the Arts, a state agency funded by the Commonwealth of Pennsylvania and the National Endowment for the Arts, a federal agency; The Pew Center for Arts & Heritage; The Philadelphia Arts in Education Partnership; The Philadelphia Cultural Fund; The Shipley-Miller Foundation; and the Board of Directors and Members of The Fabric Workshop and Museum. For more information, or to request images, please contact Anne Edgar, Anne Edgar Associates, anne@anneedgar.com and 646 336 7230 or Michele Bregande, The Fabric Workshop and Museum, michele@fabricworkshopandmuseum.org and 215 561 8888.